The Barber Half Dollar was issued between 1892 and 1916 and was part of the “Barber Coinage”. Barber coinage consists of Barber Dimes, Barber Quarters, and Barber Dimes. It sounds confusing to me but that’s they way they rolled back then..get it rolled…coin rolled…Hehe. The Barber Half Dollar was also called the Liberty Head Half Dollar and is 90% silver coinage with a melt value of $5.42. Due to public dissatisfaction with the Seated Liberty coinage in use since the 1830’s and the passage of the Coinage Act of 1890 which stated a coin could be replaced by the Mint after a coin had been issued for 25 years, a new series of coins including the dime, quarter and half dollar were designed and issued. The Barber Half Dollar, named for designer and Chief Mint Engraver Charles E. Barber. Although discussions and design competitions were held throughout the late 1880’s, none of the artistic designs entered was deemed acceptable. This led then Mint Director Edward O. Leech to bring the design project in-house. Although there were many disagreements between Leech and Barber which led to multiple design modifications, a final design for the Barber coins (dime, quarter and half dollar) were approved by President Harrison and his cabinet in October, 1891. Public reviews for the new coins were mixed with some critics panning the coins while others gave them high marks for classic design, the coins began circulation in 1892 and continued production until 1916 when the Barber Half Dollar was replaced by the Walking Liberty Half Dollar. Since government legislation gave parameters for coinage, the Barber Half Dollar adhered to those standards. This meant it weight 12.5 grams and consisted of 90% silver and 10% copper and were 30.31 millimeters in diameter. Overall circulation totaled over 213 million Barber Half Dollars from the Denver, San Francisco, New Orleans and Philadelphia Mints. 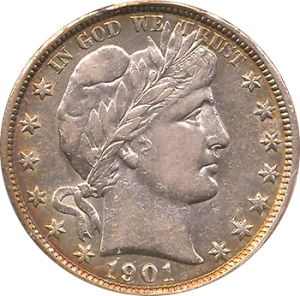 While this does make it a fairly common coin, a Barber Half Dollar from any year in virtually any condition holds a value much higher than silver spot value and certain years/mintages including the 1896-O, 1897-O and 1904-S are exceptionally rare and command an extremely high premium, especially those in Very Fine and Uncirculated conditions.